The Olympic Peninsula is beautiful. It is a hiker’s paradise, a boater’s paradise, and some might say paradise, period. Outdoor activities abound here. Cultural activities flourish. But there is something else on the Olympic Peninsula – fine, fresh food. A stroll through the Farmers Market in Port Townsend, Port Angeles or Sequim is enough to let you know that people here take their food seriously. Numerous small farmers fill their stalls with fresh fruits and vegetables each week. Be sure to bring a cooler with you, so you can stock up on fresh, tasty Olympic Peninsula produce. At the Port Townsend Market, look for berries from FinnRiver Farm, greens from Red Dog Farm, and sumptuous tomatoes from Plum Wild Farm. In addition, there are a good number of people making delicious food there: Bob makes handmade bagels, Jennifer Michele makes artisan chocolates, and long time favorite Pane D’Amore makes “to die for” cheese sticks, pastries and breads. At the Sequim Farmers Market, you’ll find fresh milk and eggs, lavender galore, and plenty of locally grown vegetables. In Port Angeles, look for Tuna Dan and grass fed beef from Clark Farms. There is a good chance you’ll find Washington State Wines and cider at these markets, too. Of course, all good food demands good wine, and that’s where we come in. Six Washington State Wineries in Port Angeles, Sequim and Port Townsend have all the wine you need: hearty reds to go with that grass fed beef, dry whites to go with the fish, and everything in between to go with everything else. 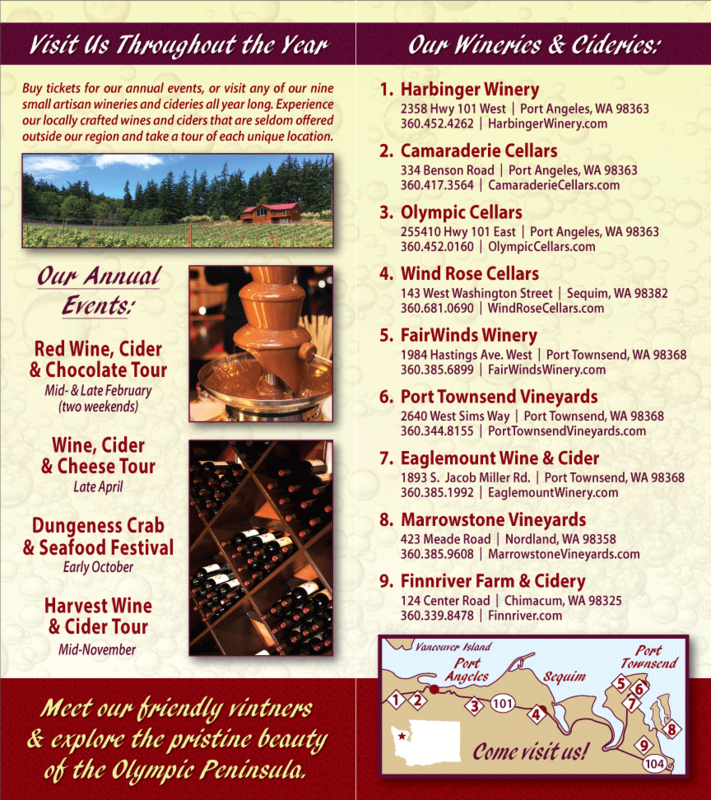 It’s fun to visit our Olympic Peninsula wineries while you’re here. Ask to sample some of our Washington State wines, and select the ones you most enjoy. Bring them back home with your cooler full of fresh food, and have a feast with friends and family.